This multi-pocketed bag fits both walkers and wheelchairs. Easily attach the Combo Walker/Wheelchair Bag over a walker bar or wheelchair arm by fastening the hook and loop tabs. Blue denim bag measures 9-1/2" x 13" (24 x 33cm). The large inner pocket measures 13" x 8-1/2" (33 x 22cm) and has a hook and loop closure. The largest of the three outside pockets measures 5-1/2" x 6" (14 x 15cm), and the two smaller pockets measure 2-1/2" x 6" (6.4 x 15cm). Weighs 8 oz. (.23kg). Machine washable. This multi-pocketed bag fits both walkers and wheelchairs. Weighs 8 oz. (.23kg). Machine washable. 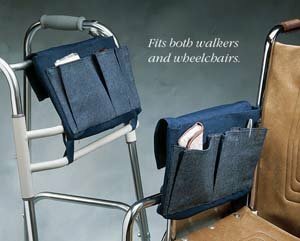 Easily attach the Combo Walker/Wheelchair Bag over a walker bar or wheelchair arm by fastening the hook and loop tabs. Blue denim bag measures 9-1/2" x 13" (24 x 33cm). The large inner pocket measures 13" x 8-1/2" (33 x 22cm) and has a hook and loop closure. The largest of the three outside pockets measures 5-1/2" x 6" (14 x 15cm), and the two smaller pockets measure 2-1/2" x 6" (6.4 x 15cm).